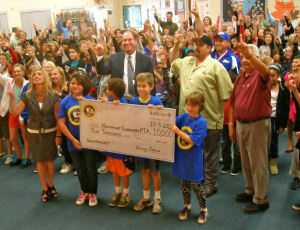 October 9, 2011 (San Diego’s East County) – Last week, the Governor’s Council on Physical Fitness and Sports Executive Director, Kenny Rogers visited Northmont Elementary School in La Mesa to honor Northmont Elementary PTA for their efforts helping children get physically active and healthy. 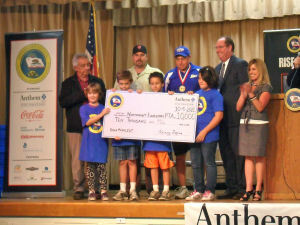 Rogers presented the school with a check for $10,000 in honor of the PTA, which is the Gold Medal winner in the Parent Association of the Year category of the Council’s 2011 Spotlight Awards presented by the Anthem Blue Cross Foundation. La Mesa Mayor Art Madrid, La Mesa-Spring Valley School District Superintendent Brian Marshall, Principal Melody Belcher and PTA President Matt Woods were all on hand for the special presentation during a school assembly. Northmont Elementary PTA was selected as the statewide Parent Association of the Year for its strong commitment to students’ health and wellness. Every day at Northmont begins with a PTA sponsored Run-For-Fun where every child has the opportunity to participate and get active. The PTA also sponsored a ballroom dance class, a Family Fitness Fair and led the school’s 3rd Annual Fit Camp in which participants not only got active, but also learned all about fats, carbohydrates, proteins and calories. With a soaring obesity epidemic and nearly two thirds of California youth unfit, the Governor’s Council on Physical Fitness and Sports has made it their mission to get California youth active and healthy. Research has shown that even small amounts of physical activity can improve health and help prevent a wide range of health problems including diabetes. The Governor’s Council on Physical Fitness and Sports seeks to establish early habits of physical activity in California’s youngest citizens and to encourage all Californians to be physically active for their health and well-being.